This SDK is intended for experienced developers and some basic knowledge of the PDF format will be required to fully benefit from the extensive features and functions available. We strongly recommend all developer to use this document in tandem with the PDF reference available freely from Adobe (see Online PDF-Reference) or the latest PDF specification from the ISO standards (for a fee). Please also note this product contains 1000's of functions, methods and properties - all listed here, but documented on varying degree's of detail due to the sheer volume of options and it is not possible to create an online help going into minutia of detail - so we have instead concentrated on those area's likely to be of interest to the majority and will expand as time and demand justifies us doing so. Where this document does not go into detail the Adobe reference document will in many cases act as a viable alternative and thus we have not duplicated - allowing us to concentrate most where we believe help is most needed. 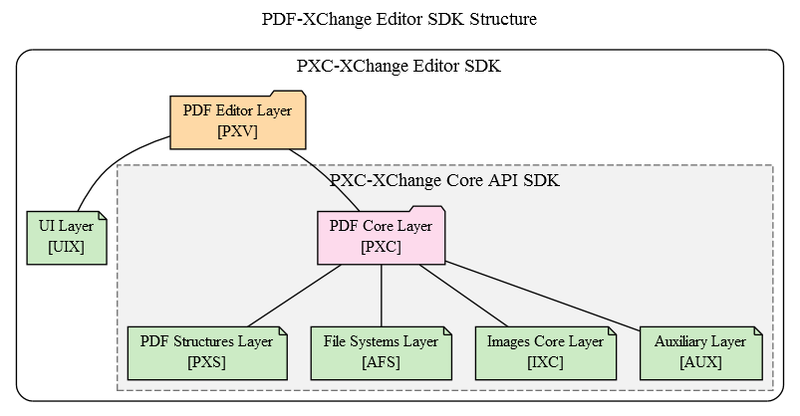 The PDF-XChange Editor SDK – itself also includes the entirety of the PDF-XChange Core API SDK functionality and additional layers that provide functionality similar that of own end-user application (created with this SDK) - the PDF-XChange Editor developers are encouraged to review this application themselves to familiarize themselves with the provided functionality and output. As this SDK has the ability to optionally load any available PDF-XChange Editor plugins (with some possible limitations, dependent on the plugin itself and the plugin authors licensing) the set of features provided by the SDK may be dramatically extended by the use of plugins. Developers can also create their own plug-ins for use by their clients or offer to other 3rd party developers or indeed to our own PDF-XChange Editor End user clients of which their are many millions, please contact us directly for further information should you wish to create a Plug-n for use by licensed end users of the PDF-XChange Editor. This library consists of a single DLL module (again offered in both 32 and 64 bit versions -: PDFXEditCore.x86.dll for 32-bit and PDFXEditCore.x64.dll for 64-bit use) and a mandatory resource file named Resources.dat that should always reside in the same folder as the afore mentioned library DLL being distributed. For detailed redistribution information please see Redistribution to Clients . For detailed information regarding licensing please see Licensing . All samples are also available on a github repository.